Hello we got our guinea pig in December 2017 from local pet store ,this is first animal for my daughter she wanted really badly ,so "Santa" got it for her .Everything was great until two weeks ago ...huge abscess under her chin, puss coming out, we rushed to the exotic vet he prescribed an antibiotic for two weeks and pain meds .Turned out at the visit that this is he not she.Tomorrow will be two weeks I noticed like 3 days ago another 'bag' under chin I couldn't believe in another abscess the other one we cleaned very well wound healed ...that what we thought.Today I noticed white dot on skin close to the original wound made a warm compress and puss start coming out, but just a little bit, still can feel big lump.Is that even possible while he is still on antibiotic.I love Jolly and I want him to be healthy my daughter don't want to hear he will not recover I am paying lots of money for vet and meds is there is a way to avoid this,He has been with us only 3 months. Last time vet said if meds will not help he will have to do surgery, another $ and i don't know if abscess will not be back after all.What you guys think.also having hard time to find exotic vet in Thornton,Colorado I found one near by but maybe I should consult with other vets?? Don't want to wait too long.Please help. Either way, at a minimum, the pig needs antibiotics and the lesion needs to be flushed with sterile saline twice a day to get the pus out and let it heal from the inside out. Guinea pig pus is very thick and cheesy, and it's almost impossible for antibiotics to penetrate it. So you have to get rid of the pus, but the antibiotic is needed to clear up any remaining infection. So if it seals over, soak the scab with a warm wet compress until you can pick it off, and keep flushing. As it heals, it will get shallower and shallower, until it finally heals at the top. However, if it recurs in the same place, the pig may need surgery to determine if there is a capsule that keeps refilling. If that's the case, then the capsule needs to be removed to prevent that from happening again. However, as surgeries go, it's not too bad, and the pig generally recovers well. Broomfield Vet Hospital has two vets with exotic experience, according to their website. So does The Animal Doctor. It's definitely a good move to see an exotic vet -- most small animal vets have no experience with or knowledge of exotic pets. Thank you for your response I am going to vet tomorrow my only concern is that he is already on antibiotic so i do not know if I they will change it or say he needs surgery,if yes did you had to do that before or heard about someone who did ? and how much will cost ,they won't tell me over phone they say they have to see him again .I know each state and city will have different prices but maybe there is some kind of average on such costs, the visit itself was for us 60$ plus meds 100$ .I want him help but at the same time can't spend another hundreds of dollars .Do you think surgery will help for sure that the abscess will not reappear again?? There's no way to know what it would cost. I had a pig that needed a bladder stone removed. I called three exotic vets in Houston, and was quoted prices of $400, $650, and $1600-$2400, depending on what they needed to do. The price you paid for a visit and meds seems very reasonable to me. And yes, I've known pigs that needed that surgery. There's also no guarantee that the abscess won't recur. But I'm not convinced this is an abscess. Lumps under the neck are usually cervical lymphadenitis. A good exotic vet could tell you. You might investigate Care Credit with your vet. Or if you can't afford his medical care, maybe you can find a rescue to surrender him to. I know money can be tight, but pigs depend on you for everything, and medical care is just as important as food and housing. FYI, it will make your posts easier to read and you'll get more responses if you break them up in paragraphs with double spaces. This is what a curved tip syringe looks like. If he/she only cleans and flushes it, you might end up continuing to flush it to make sure it heals from the inside out. A warm sterile saline solution is usually used. The antibiotics you got are a good idea. Weigh your pig daily to make sure he does not lose appetite (which can happen while on antibiotics). Sometimes a vet puts in a "drain" (open ended tube) which helps with the flushing. 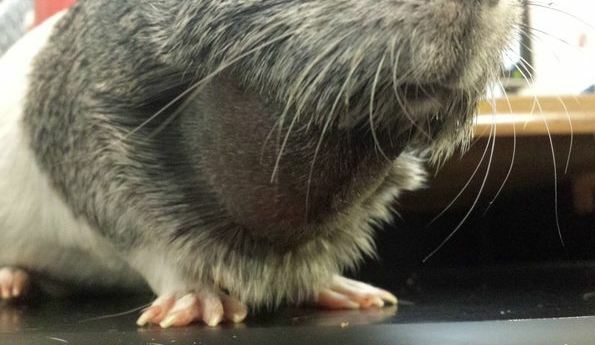 I had a guinea pig have 2 surgeries for an abscess on her head. It was over 10 years ago and in the Cleveland, Ohio area. I think I paid $200 for the first surgery and possibly closer to $300 for the second surgery with a different vet. The second surgery was successful and she lived another 7 healthy years. She was a super-sweet guinea pig (one of my all-time favorites). Are you actually reading the posts we're making? You CANNOT soak pus out of a wound on a guinea pig. It has to be FLUSHED out, with force behind the syringe. I wonder if Jolly meant that the opening they recently found the pus coming out of in the first post was too small to flush? 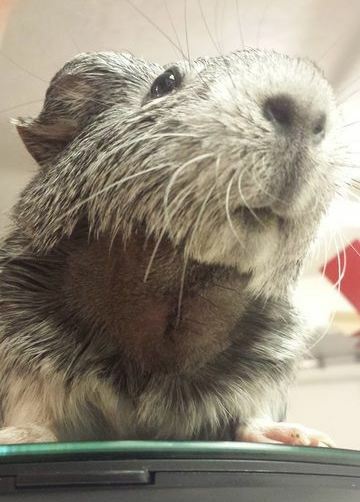 I had a pig with an abscess under the chin that had two surgeries (there were complications) to remove/drain it. After the complications were taken care of, she recovered quite well and is still living comfortably 2 years later. Total cost was around $500, but if you don't count what I paid because of complications it would have been a bit less than $300. This was in Utah, though- I live in Colorado as well and surgeries/appointments have been a little more expensive here. I would expect the base cost of noninvasive surgery to be around $300-$400. It will be more expensive if more diagnostics are necessary, or complications develop that require a second surgery or additional medications, etc. Bpatters is right, though- a pus-filled wound on a guinea pig will not go away with only antibiotics. In order for the antibiotics to work, the pus has to be removed or else it will just sit there re-infecting the wound. If it is an abscess, another thing to consider is whether the antibiotic you've been prescribed is effective on the bacteria causing the infection. When our boy had one, they drained the abscess and prescribed bactrim as a broad spectrum antibiotic. They tested the pus and it turned out there were two different types of bacteria present and the bactrim was only effective on one. He had to be put on a second antibiotic to fully knock it out, but it didn't come back. The testing may not be cheap, but it can tell you more about what's going on. bpatters yes I am reading a posts ... I guess my english is not like yours guys, so sometimes its hard for me to write what I mean ..I was making warm compress in order to open the wound like doctor reccomended.I am not an american so sorry if sometimes you will understand something different than I meant. The would is tiny I can't flush out I was today at the vet and they are recommending another antibiotic or possibly surgery the estimate is 600$ plus meds and re check up visits I cant afford this now so I will stick with another antibiotic for know .Thanks all for your input . Can you get your hands on a curved tip syringe that looks like the one above? I think you will need it. Hello our boy is after surgery of removing abscess they had to Remove in “whole” instead of just cutting and let it drain .We decide it on that after it grew quite large and second antibiotic did anything , but stopping him from pooping . After we stopped medicine he went back to eating drinking and pooping . On Friday he had surgery he recovered pretty well within 24 h . I will see vet again on Friday so incision can be checked he is on antibiotic and pain medicine , his skin was pretty stretched but now it seems it’s filled with something again it feels soft when he stretches it’s smaller but I don’t know if I should be concerned . What do you all think .???? Is it just body fluids or tissue or what ??? If it's still swollen in the morning, I'd call the vet. They may want to see him. Thanks bpatters I will ... when he kind of „ shakes off” I can hear Like „ water” sound .... is there is a possibility to add some photos to reference what I am talking about ??? I called the vet and he said that this is normal body reaction. There is empty space after removing abscess and body fills it with a seroma and that I am right when I hear "water" like sound. I will go and see him on friday so they can check on stitches and drain that liquid if necessary but body should absorb that liquid over time time. Do let us know how it goes. If it was indeed removed in its entirety and it was a clean removal of the abscess, closing it may work to let it heal okay. You will want to watch for signs of infection (tenderness, seems to hurt when you touch it, redness). I hope it heals fine. If you are not currently doing so, I would also weigh daily so you have an extra method of evaluating how well he is doing. She needed a surgical (Penrose) drain put in to keep the wound from closing up, and flushed several times a day with saline solution. And then other stuff happened too, but hopefully that won't be relevant to your pig's case. :') Every pig and every surgery is different of course, but given the similarity of the locations and concerns I thought you might find it helpful to compare your pig's swelling with mine.